Join us for some unbee-lievable kid’s activities at the Wanneroo Regional Museum this April School Holidays. What can honey be used for? What does beeswax smell like? How do bees help the environment? Visit the museum to find out the answers to these questions and more! With a series of bee themed activity stations to captivate curious minds, such as crafting your own busy bee, dressing up as a beekeeper or playing with some beeswax. 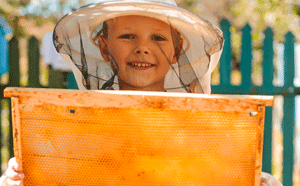 Wanneroo Regional Museum is where the buzz is this April School Holidays!